Bronco Mendenhall took over the BYU football program in 2005, after having worked as the defensive coordinator during the 2003 and 2004 seasons. Since taking over the program, he has a 56-21 record (.727), including three 11 win seasons, and a ten win season. Four seasons of 10+ wins in a row had never been done at BYU, and Bronco’s current win percentage is higher than Lavell’s. Bronco also owns a 4-2 record in bowl games. When you consider that BYU is 11-17-1 all-time – Bronco already owning more than a third of those wins is impressive. We all understand, I think, and we appreciate the amazing coach we have right now. Four years under Gary Crowton left fans wanting something, ANYthing else out there. So the defensive coordinator is called up to be the head coach. Honestly, at the time, I didn’t hardly know anything about him. He had a good football name: Bronco. He took over a program that had won 5, 4 and 5 games in its last three seasons. This, in a program that was not used to losing seasons, and prior to the “Crowton era”, BYU had not had a losing season since 1973. In Bronco’s first season, 2005, his team finished 6-6, breaking the sub .500 streak set by Crowton. I believe this was as close as the Cougars have come to perfection since 1984. They did lose two games (only one in 1996), but they lost by razor-thin margins. The Cougars started out with a three point, last second loss to Arizona (FG with 0:01 remaining). They beat Tulsa, and then dropped a 2OT decision to Boston College on the road – a game where Quarterback John Beck was injured, but played through to the end. The Cougars then reeled off nine straight wins, including a perfect 8-0 in Mountain West play, and the “Harline is still open” game over Utah (one of those MWC games). They were pitted against Oregon, where Gary Crowton was then the offensive coordinator, and they drubbed Oregon 38-8. Bronco Mendenhall stated that the early setbacks provided motivation for the team to perform the way they did the rest of the season. 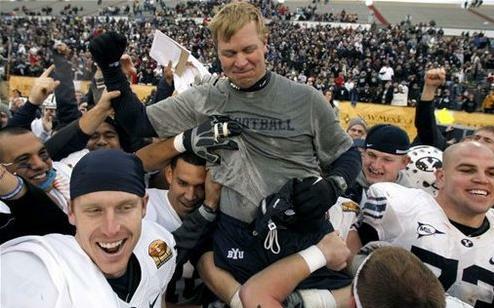 Bronco Mendenhall was awarded MWC Coach of the Year honors after bringing this team to an 11-2 record. Bronco had a new quarterback in Max Hall, and a new RB named Harvey Unga. These unknown factors left some question as to what sort of success we might see in 2007, and a 1-2 start again left fans wondering if maybe 2006 was just a fluke. But, like 2006, BYU reeled off nine straight wins, including all 8 in conference, and the “4th and 18” win over Utah. The bowl matchup that year was interesting, as we were pitted against UCLA, which was one of the two teams to beat us earlier in the season (the other was Tulsa). BYU ended up beating UCLA by blocking their last second field goal attempt (it was Eathyn Manumaleuna that got his hand on the ball), 17-16. For the second year in a row, Bronco led his team to an 11-2 finish. The season began with the highest of expectations. So many returning starters. This year was the first that Bronco’s club didn’t start out 1-2. They began the season a perfect 6-0, including wins over Washington (28-27) and UCLA (59-0) of the Pac 10. Ninth ranked BYU was then blasted by TCU 32-7, and also took a blowout loss to Utah to end the regular season. Seemingly uninspired, they lost to Arizona in their bowl game, 31-21, and dropping to 10-3 on the season. This season came along with an exciting opportunity. #20 BYU was scheduled to play #3 Oklahoma to start the season. They played in “The House that Jerry Built” the new Dallas Cowboys stadium. They were up against Heisman winner Sam Bradford, and the rest of the Sooners – runners up in the national championship game from the previous season. BYU went down there and beat the Sooners 14-13. While Sam Bradford was injured in the game, and Oklahoma went on to just an 8-5 record, this is still one of the greatest wins in BYU history. BYU was ranked 7th when, later in the season, they were demolished by Florida State, and later received a similar thumping from TCU. BYU ended the regular season 10-2, including the “Hall to George in OT” win over Utah, and drubbed Oregon State 44-20 in the Las Vegas Bowl to end the year at 11-2. 2010 began again, as an unknown. BYU had lost Hall and Pitta to graduation, Unga to the honor code, and many other great offensive and defensive starters from the previous year. They had Jake Heaps – scout.com’s #1 quarterback prospect as a new quarterback, and Riley Nelson, who previously had been Max hall’s backup. BYU attempted to implement a two quarterback rotation with Nelson and Heaps. This arrangement worked initially, as the Cougars began the season with a win over Washington and the highly-touted Jake Locker. That success was short-lived, however, as BYU followed that up with four consecutive losses, including a 31-16 loss to Utah State. During that string, Riley Nelson was injured, and Heaps took over as sole starting QB. After the Utah State loss, Bronco Mendenhall made the tough decision to fire defensive coordinator Jaime Hill, and to resume the dual responsibility of head coach and defensive coordinator. As of that moment, BYU was a different team. They went 5-2 the rest of the season, with a quality win over San Diego State, and losses at ranked TCU and Utah (the Block). The Cougars made it back to 6-6, after having started 1-4. They went to the New Mexico Bowl against also 6-6 Utep, and beat them handily, 52-24, ending the season 7-6. Bronco felt midway through the season that he had lost the heart and soul of his team, and by resuming his defensive coordinator duties, he brought himself closer to the players again, and captured what they had lost. The Cougars were ranked worse than 100th in many defensive and offensive stats at the end of the Utah State game. The defense was able to turn around so dramatically, that they are currently in the top 25 in total defense. Jake Heaps also came alive during this stretch. In his first 7 games, he had one TD pass, and 6 INTs, while in his final 6 games, he rose to 14 TDs to only 3 INTs. So, which of all of these was Bronco’s best season? Arguments could be made for any of them. 2005 had a non-losing record a return to a bowl game. 2006 and 2007 were perfect MWC years with 11-2 records overall. 2008 had a 6-0 start. In 2009 BYU beat #3 Oklahoma, went 11-2, and had a huge Bowl win over Oregon St.
For me though, none of these great years will compare with this one. The year that BYU went just 7-6. Sure, Bronco allowed a two quarterback system to start the year, and we can never know just how much negative impact that had. But when Bronco realized what had happened within his program, that he had “lost” it, he made tough decisions. He fired a coordinator in the middle of a season, and assumed the responsibilities himself. He took heat for the decision, yes, but even fans had begun to question his leadership as we posted losses to WAC teams in consecutive weeks. He recognized the flaw in his program, and he corrected the course. How many teams start 1-4 and turn around to make it to a bowl game? Most throw in the towel and call it a “rebuilding year”. Sure, this was a rebuilding year for the Cougars, but we didn’t have to suffer through an 1-11 (or similar) campaign and have changes made during the off-season. The turnaround is remarkable, and the difference in emotion and execution by the players has been amazing. This season is Bronco’s greatest one to date, and the future of the program has never looked better. He has assembled an amazing team – with last year’s recruiting class ranked 22nd in the country, and 2009’s class was ranked 40th (both by Scout.com). This off-season has already brought even more tough decisions, as it was revealed this week that his offensive staff is under review, and only time will tell who stays and who goes. One thing is for sure, the ones that stay will be ones that share Bronco’s fire and vision for his team. I, for one, have come to trust that vision, and I’m excited about the future of BYU football under Bronco Mendenhall.